In the great model prayer that our Lord gave to his disciples, we are provided with perhaps the most perfect desire in a prayer that one could ever entertain for the world. In the short prayer, Jesus prayed, "Our Father, which art in heaven...Thy kingdom come, thy will be done on earth as it is in heaven" (Matthew 6:10). This is the powerful hope at the core of Christian affection – our vision for a world that is not yet, but ought to be. I can take no credit for the eloquent phrase, "a world that is not yet, but ought to be." I acknowledge that axiom comes from a sermon of more than a half century past written by the late Southern Baptist, Theodore F. Adams. "Correct us, O Lord, where we are wrong. Confirm us wherever we may be right. Grant us wisdom to distinguish thy will and courage to do it. Give to each of us a steadfast heart which no unworthy affection may drag down, a clear vision which cannot be warped away from truth, a firm loyalty which cannot be tempted aside. "As we have mastered nature, so that we might gain wealth, help us now to master the social relations of mankind that we may gain justice, peace, and a spirit of brotherhood. "Remind us that only the humble may house thee, only the pure in heart can see thee, only the merciful may know thee, only the brave can experience thee, and only the patient may serve thee truly. Adams prayer is not only consistent with the way Jesus taught his followers should make their petitions to God, but it also clearly articulates the Christian worldview. It points to a world that is not yet, but ought to be. Everywhere we look in the world there are serious tensions and conflicts – economic struggles, racial and social struggles, lawlessness, violence, addiction problems, the threat of war – great moral and political challenges. And if the kingdoms of this world are really to become the kingdom of our Lord, then it is the duty of everyone who names Christ as Lord to see that he really does become the Lord of all of life. Certainly this involves engagement by Christians in the public arena. Some Christians, however, are quite dismissive of this point. Recently I was reading after a great Christian writer I deeply admire, but on this occasion I had to strongly disagree with him. He told a story about a church officer who came to his Sunday School class wearing a large pin promoting a certain candidate for President. The pastor urged the man to take off the pin. The church officer protested, saying, "Why take it off? He's a perfectly good candidate for President!" 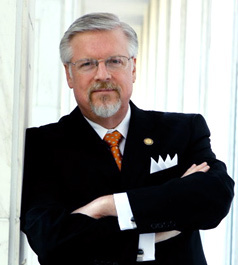 "Well," said the pastor, "it might offend someone of a different political party and keep him from hearing the Gospel and getting saved?" So the man acquiesced. The writer then went on to imply that this was the proper role of Christians. In other words, Christians must be careful of all things political lest they offend unbelievers and cause them to stumble and turn away from the Gospel. I can certainly understand why some might be squeamish about hawking a certain political candidate or party at church. Nevertheless, Christians must also see that many of the issues of our day are of great moral import and intertwined closely with politics. I would even go so far as to suggest involvement in current politics by God's people should not be seen as a hindrance to evangelism, but instead the springboard for presenting Christ to the masses. What's happening in public affairs nowadays is a clear and present demonstration of the reason Christ died on the cross – the sinfulness and brokenness of mankind – the need for redemption. He came to save the nations – to make a world that is not yet, but ought to be. "The world that ought to be" – that is the world that Jesus came to teach us about, the vision he shared, and the world he sent his disciples to win. "In our relationships as Christians, some of our basic concepts, interestingly enough, are voiced for us in two salutes that we say year after year and which we teach our children. "In the salute to the American flag we say, 'One nation under God, indivisible with liberty and justice for all.' 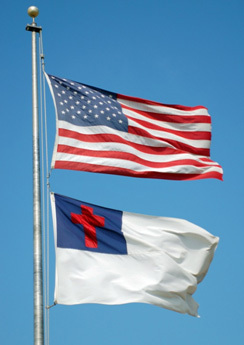 In saluting the Christian flag we add: 'And to the Savior for whose kingdom it stands, one brotherhood, uniting all mankind in service and in love.' Only as we live and abide day by day by those basically Christian concepts can we ever have a world with peace on earth and goodwill toward men. And may I add, it was this same vision that Jesus articulated when he taught us to pray, "Our Father, which art in heaven...Thy kingdom come, thy will be done on earth as it is in heaven." It is not simply for the saving of souls believers strive, it is also for "a world that is not yet, but ought to be."